Maybe if I work on this synopsis of the last few months a few minutes a day, I will catch up. The move: As you know, my mother bought a house and we both moved in mid-August. It has been non-stop activity since and it is still on-going. I am very tired of moving! My mother's townhouse: We decided to tackle moving my mother's stuff out of her townhouse first because it was smaller than my house and close by. When we had removed most of the personal items, we asked our realtor how much stuff to leave for "staging"and what to take out. The realtor came over, gave some suggestions (less is more) and commented that another realtor in her office had some out of town clients looking in the area the next day. My mother gave her permission to show it even though it hadn't been cleaned and was still in disarray. Surprisingly, the people liked the townhouse and made a full price offer. We were thrilled and made plans to move the rest of the stuff out. 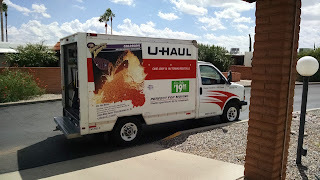 It was hot and a lot of work but with a rented Uhaul truck and two rented guys, we got it done. Unfortunately, ALL of the stuff, including the trash, was now at the new house. We are still sorting through it. My house in Tucson: It has been very hot and finding the time to drive to my house, 45 minutes away, has been difficult. 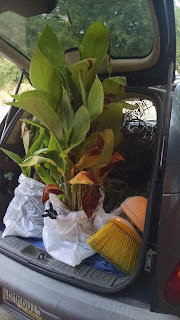 I have made a few trips, car loads, pick-up truck loads. What remains is the miscellaneous, most of which can be given away or taken to my property. These things are most tools, gardening items, fencing, anything I won't be needing in the suburbs. The new backyard has very little garden space. I've been throwing old seeds out by the drip system emitters. That's the extent of my gardening, at the moment. The new house does have roses and citrus trees so keeping those alive is enough responsibility for now. This week, my handyman has begun the repairs I need to do before I list it for sale. I do want to replace the kitchen cabinets but haven't figured out exactly what to replace them with. Maybe IKEA cabinets if I can take a day off. 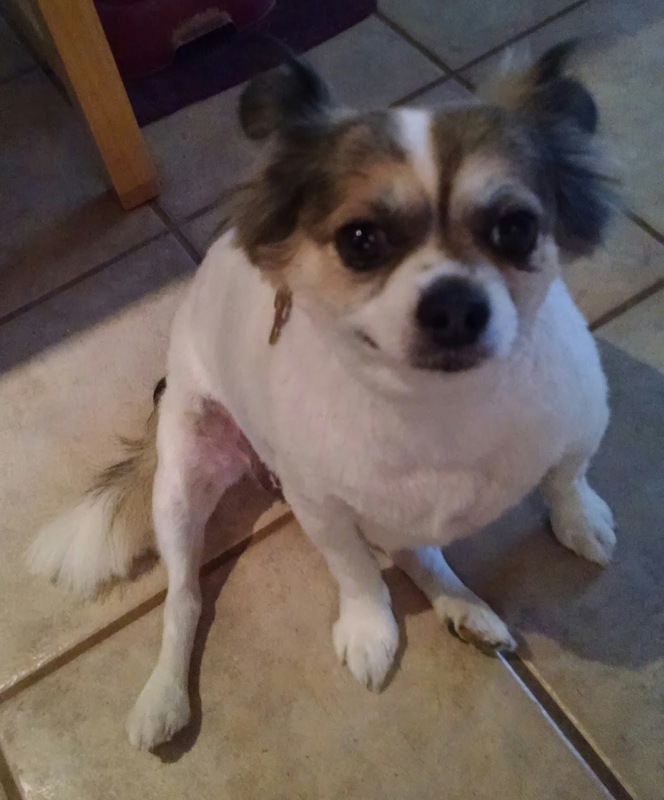 The dogs: I got Francis adopted the Saturday before I moved. That was very fortunate as she was the most energetic and the loudest barker. I brought 4 dogs to the new house and talked to all of my neighbors who were home to let them know to tell me if the dogs bothered them. Everyone was fine...until last week. The snowbirds who live on the corner came back and the dogs barked like crazy when they heard new voices. 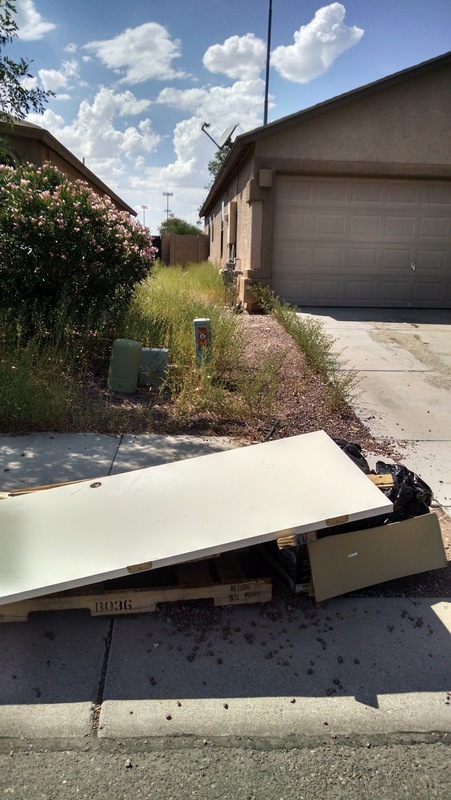 The neighbors complained to the homeowner's association and we got a visit from them. Turns out the neighbors like to eat breakfast in their backyard. So, out came the bark collars and I had a nice chat with the neighbors and gave them my number in case the dogs start barking again. BUT...I also got my last foster dog adopted last week and we finally got solid gates on the fence so the dogs can't see the people who walk down the alley. Big improvements. Living with my mother: It's a work in progress. Between moving, selling my house, my job, and regular life stuff, I don't have a lot of time. My mother wants to watch movies and I just want to take a nap. She does the grocery shopping and the dishes, which is very nice. I make dinner on the weekends and try to have enough leftovers for the week. 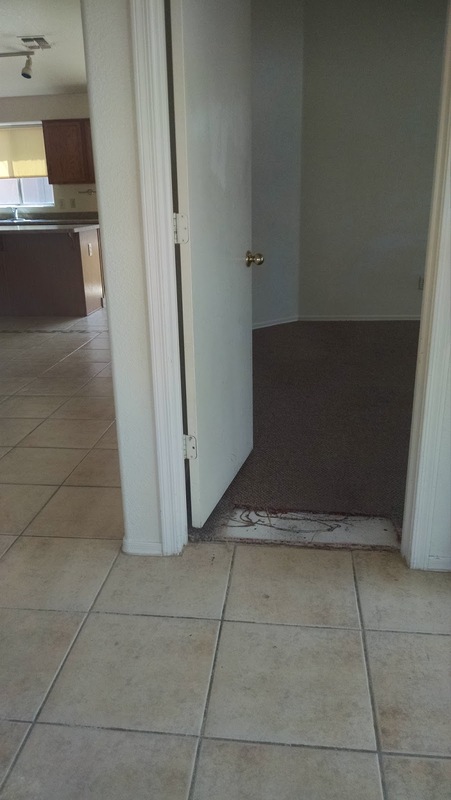 Rental house #1: I got a notice that the tenants were moving out in August. Almost immediately, I got a notice that new people were moving in. There are always repairs and cleaning bills so I waited for the email. The second week in September, I got an email from the management company that said I needed to authorize $2500 in expenses so that the tenants could move in in 3 days. I was like, um, no, you're fired. They were apologetic and re-did the estimate. I looked at the property and decided to pay for carpet replacement, got my handyman to clean up the yard, and took a day off work to paint the walls with my handyman which only cost $350 rather than the $1,100 that was quoted to me. I also took down the old window shades and put up shear curtains. The tenants decided not to move in but I got to keep their $850 deposit and new tenants have since signed a lease. Hopefully, Rental house #1 will be stable for a while. Rental house #2: My tenant, the one that was living out in my mobile home and then I bought this little house in town for him to rent, has decided to move to Brazil at the end of the month. He wants me to help him re-home his 2 dogs and 2 cats. Unfortunately, I am not in a position to foster so I can only help with advertising them. Soon, I will need to find a new tenant. I've had a few inquiries but the area of town that it is in isn't the greatest and I don't think either of the single women who inquired would want to live there. Someone will appreciate it though. Hopefully, a responsible person who always pays their rent on time. 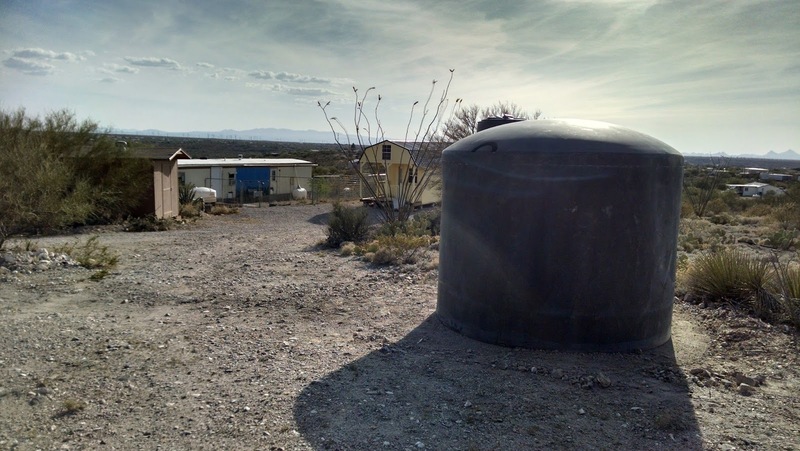 My mobile home property: It's being totally neglected. I go out there to collect the mail once a month. The weeds are taking over. I hate seeing it like that but I don't have the time or money to work on it yet. Once my house sells, maintaining the property will be easier. Maybe I will even have some money for more improvements like bringing electricity to the barn-shed and building more fencing or walls to keep out the snakes. My job: It is going crazy. They let one person go from our office and they have asked me to go to out plant in Mexico twice a week. So far, I've only been going once a week because I get so behind on my emails when I go down there. I want to take some time off to work on the house that I will be selling but I just seem to be getting more and more behind every day. I think I will take a half day every Friday anyway because I have some vacation time to use before December. Since I'm going to the Mexico plant, I've finally started trying to learn some Spanish. I downloaded the Duolingo app on my phone and I have practiced every night for 2 weeks. The beginning stuff was easy because I did have Spanish in high school but it is quickly getting harder. The most of the people at the plant speak English but I tell them all that I am trying to learn so they teach me new words. Todays word was carrots: zanahorias. There you go. The quick synopsis. My home computer is still dead and I don't have the new laptop they are supposed to be buying me yet. Maybe next month. Wow! And in all of the excitement I missed that you bought another house! Do you remember how quiet it was out on your land with just the cat and a few dogs?? Hopefully it all starts to fall into place soon. I would help if i was closer, honest! As usual, Daizy, I get worn out just reading about all of your misadventures. But I'm glad to see how much progress you have made on many of them. thank you for updating. I hope you can get a break soon so you can recoup energy. Your life sounds very busy/exciting right now. Maybe you will get some timer over Thanksgiving/Xmas. How can fences and walls keep out snakes? @Practical Parsimony, our rattlesnakes are rather lazy and prefer to use squirrel and rabbit holes to get under things rather than climb. They can climb if they have a nice slanted tree limb or a wall with protrusions to grip. They are not nearly as talented as the snakes I've seen videos of in the south, climbing a brick house. So a block wall with a 18"-2' deep footer that is 4' tall can keep out most venomous snakes here as long as the gate doesn't have gaps in it. The exception would be the local coral snake which is very small but they are rare. @Anonymous, Thanksgiving break didn't work out as planned but I have high hopes for December! @Dave, I'm still trucking along. Much slower than anticipated but I see an end in site. @Lizzie, it's funny how I dream of being back out on my land even with the snakes, lack of water, questionable electrical wiring and dirt roads. Some day I'll get there. How is your nephew doing? Hope he is enjoying his college experience.